The makers of the famous double ended G-vibe have released a new group of products called their Gjuice line which comprises of a silicone lubricant, a water based lubricant and the product I’m reviewing, a toy cleaner. Realising that Toy Cleaner isn’t in itself an exciting product Fun Toys the makers of Gjuice have come up with a really good marketing package. The Gjuice Toy Cleaner is presented in a matt white cylindrical box (a departure from the standard square one.) and the artwork is very clean and crisp using just two colours black and red. On the front of the box is Fun Toys distinctive Calla Lily image adorning a bottle of Gjuice Toy Cleaner and on the rear, information about the product which is difficult to read due to its small point size. Even with my vari-focals on I couldn’t read the text very easily. If I could offer some constructive criticism it would be that the text should be enlarged, after all there is plenty of room to do this on the rear of the box. I found turning the box upside down and tipping the bottle of toy cleaner on to your waiting hand the best method for removal as the packaging is very snug and creates a vacuum around the bottle. A clever addition to the packaging is a discreet plastic ring around the neck of the bottle to avoid unwanted “pumping” when in transit. And we wouldn’t want any of that would we? Sorry, I couldn’t resist that one. 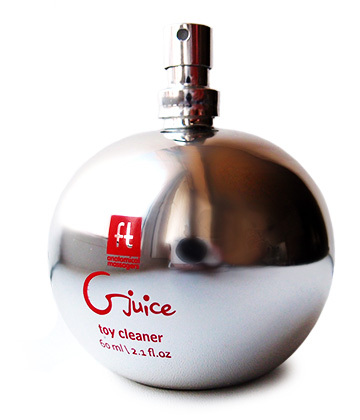 Gjuice Toy Cleaner atomises cleanly from the pump leaving no residue around the neck of the bottle and has a light cherry like aroma which smells fresh not sweet or sickly. This product can be used on silicone, rubber and latex toys and complies with the FDA regulations set by the US which are quite stringent and differ from those in the UK/EU though in general offer the same assurance of safety.